On Thursday, I’m heading out to the fortieth annual International Conference on the Fantastic in the Arts in Orlando, Florida, where I’ll be participating in two events. One will be a reading at 8:30am featuring Jeanne Beckwith, James Patrick Kelly, Rachel Swirsky, and myself, moderated by Marco Palmieri. (I’m really looking forward to meeting Jim Kelly, who had an unforgettable story, “Monsters,” in the issue of Asimov’s Science Fiction that changed my life.) The other will be the panel “The Changing Canon of SF” at 4:15pm, moderated by James Patrick Kelly, at which Mary Anne Mohanraj, Rich Larson, and Erin Roberts will also be appearing. In other news, I’m scheduled to speak next month at the Windy City Pulp and Paper Convention in Lombard, Illinois, where I’ll be giving a talk on Friday April 12 at 7pm. 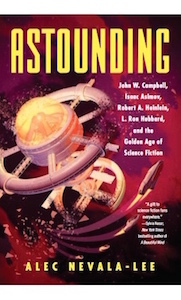 (Hugo nominations close soon, by the way, and if you’re planning to fill out a ballot, I’d be grateful if you’d consider nominating Astounding for Best Related Work.) And if you haven’t already seen it, please check out my recent review in the New York Times of John Lanchester’s dystopian novel The Wall. I should have a few more announcements here soon—please stay tuned for more! If that part of science which is regarded as stable be called basic, then the traditional method is to take as basic that which at the time is consciously unattained, whilst I take as basic that which at the time is consciously attained. Whilst the traditional way is to regard the facts of science as something like the parts of a jigsaw puzzle, which can be fitted together in one and only one way, I regard them rather as the tiny pieces of a mosaic, which can be fitted together in many ways. A new theory in an old subject is, for me, a new mosaic pattern made with the pieces taken from an older pattern. Wherever God or Christ are represented as symbols for everlasting truth or justice they are given in the symmetric frontal view, not in profile. Probably for similar reasons public buildings and houses of worship, whether they are Greek temples or Christian basilicas and cathedrals, are bilaterally symmetric. It is, however, true that not infrequently the two towers of Gothic cathedrals are different, as for instance in Chartres. But in practically every case this seems to be due to the history of the cathedral, namely to the fact that the towers were built in different periods. It is understandable that a later time was no longer satisfied with the design of an earlier period; hence one may speak here of historic asymmetry. Here the hose…is the prescribed problem-solving tool, a deus ex machina direct from the Sears lawn and garden center. Its most obvious function is routing pressurized water from the leaky spigot to Nancy’s itchy trigger finger. But that route has been detoured. Winding and curved like a black cobra in repose, out of the panel and then back in, the hose also diverts and achingly prolongs the proceedings…In the overall composition of this strip, the hose diagrams and embodies this quickening narrative tension. Functioning somewhat like a dining room table extension leaf, it sustains the tension created by the first two attacks on the left—as well as ensuring the inevitable release on the furthest right. It’s just the Notes app on my phone. Everybody I’ve talked to, every cartoonist, or like, the vast majority of us, have some notes program with ideas, and maybe a third of them are comprehensible and the rest you’re like, What was I thinking when I wrote this down? Autocorrect is terrible for this. Autocorrect has probably killed hundreds of jokes for people, because they have a great idea and they write it down, but they spell it wrong, so it changes to something else, and then they’re like, What was this idea? I realized that all of the nouns that Nancy used to have are being supplanted by a phone. Things that she would have lying around the house to make up a joke are gone. She uses megaphones for a ton of things in Bushmiller’s strips, and I don’t have megaphones lying around my house. So how, then, can Nancy solve problems, given that technology is advancing to the point where problems are being solved in really nonphysical ways? That’s why I’m making her learn robotics. It opens up a wider range of visual gags to make down the line. The italics are mine. Nancy’s megaphone is gone, replaced by a new category of props that lead to gags and stories that are as organic, in their way, as Sluggo’s water pistol. (As Jaimes observes: “I’m basically cutting out a third of my life that people could relate to if I exclude phones.”) Not surprisingly, the results have been controversial among longtime Nancy fans, whom Jaimes seems happy to annoy—but the strip as it currently exists is a worthy successor to the version that Karasik and Newgarden thought was worth anatomizing for tens of thousands of words. As they write in the conclusion of their analysis of the garden hose: “Tension is a prerequisite of laughter.” And all that it took to restore this tension to Nancy was the addition of a few crucial objects. In their purest form, [flat characters] are constructed round a single idea or quality: when there is more than one factor in them, we get the beginning of the curve towards the round…One great advantage of flat characters is that they are easily recognized whenever they come in—recognized by the reader’s emotional eye, not by the visual eye, which merely notes the recurrence of a proper name. In Russian novels, where they so seldom occur, they would be a decided help. It is a convenience for an author when he can strike with his full force at once, and flat characters are very useful to him, since they never need reintroducing, never run away, have not to be watched for development, and provide their own atmosphere—little luminous disks of a pre-arranged size, pushed hither and thither like counters across the void or between the stars; most satisfactory. This kind of insight from a professional novelist is cold, hard cash, and it reminds us that a round character isn’t necessarily better than a flat one. “A novel that is at all complex often requires flat people as well as round,” Forster says, and I don’t think I’m alone when I say that I frequently get more enjoyment from stories populated by vivid flat characters than by the indistinguishable round ones of so much modernist realism. Yet there’s an even deeper point to be made here, which is that flatness may actually be closer to how we think about the people around us, or even about ourselves. We can start with Forster’s observation that flat characters are often more memorable than round ones: “They remain in [the reader’s] mind as unalterable for the reason that they were not changed by circumstances; they moved through circumstances, which gives them in retrospect a comforting quality, and preserves them when the book that produced them may decay.” And I’d argue that we also remember flat characters more clearly because they partake of the ways in which we see the supporting players in our own lives. When we think of neighbors, coworkers, and other casual acquaintances, we’re likely to associate them with one or two obvious qualities, if we even manage to have a distinct impression of them at all. It’s only the ones we know best—our families, lovers and closest friends—that we can grasp with the nuance with which we view the roundest characters in fiction. And this can even extend to our own motivations. It’s hard for us to integrate all aspects of our past and personality at once, except when it takes the form of instinct. Most of our actions are intuitive or habitual, and when we need to consciously pay attention, it’s easier to emphasize one part of our identity at a time. We can switch between roles multiple times each day, or we can play a single part for years. It’s an adaptive strategy that makes it easier for us to act and make decisions. We’re only one thing at a time because that’s all we can keep in our heads at once, and the other sides of ourselves have a way of falling into line. Liberal Democrats were much more likely than conservative Republicans to start identifying as Latino or saying that their ancestry was African, Asian or Hispanic. Conservative Republicans were much more likely than liberal Democrats to become born-again Christians and to stop identifying as non-religious; liberal Democrats were much more likely than conservative Republicans to leave religion and stop describing themselves as born-again. Conservative Republicans were more likely than liberal Democrats to stop describing themselves as lesbian, gay or bisexual; liberal-leaning Democrats were more likely to start identifying as lesbian, gay or bisexual. Bacon concludes: “Increasingly, the political party you belong to represents a big part of your identity and is not just a reflection of your political views. It may even be your most important identity.” And this strikes me as only a specific case of the way in which we flatten ourselves out to make our inner lives more manageable. We pick and choose what else we emphasize to better fit with the overall story that we’re telling. It’s just more obvious these days. [Flat people] are best when they are comic. A serious or tragic flat character is apt to be a bore. Each time he enters crying “Revenge!” or “My heart bleeds for humanity!” or whatever his formula is, our hearts sink…It is only round people who are fit to perform tragically for any length of time and can move us to any feelings except humor and appropriateness. Cultures have a way of taking psychological cues from their heads of state. As Forster says of one critical objection to flat characters: “Queen Victoria, they argue, cannot be summed up in a single sentence, so what excuse remains for Mrs. Micawber?” When the president himself is flat—which is another way of saying that he can no longer surprise us on the downside—it has implications both for our literature and for our private lives. The process is already happening. And it shouldn’t astonish us if we all wake up one day to discover that the world is flat. Tagged with Aspects of the Novel, Barack Obama, Donald Trump, E.M. Forster, FiveThirtyEight, Patrick Egan, Perry Bacon Jr. Contrary to the strict division of the activity of the human spirit into separate departments—a division prevailing since the nineteenth century—I consider the ambition of overcoming opposites, including also a synthesis embracing both rational understanding and the mystical experience of unity, to be the mythos, spoken and unspoken, of our present day and age. We now give more serious weight to the words of a country’s poets than to the words of its politicians—though we know the latter may interfere more drastically with our lives. Religions, ideologies, mercantile competition divide us. The essential solidarity of the very diverse poets of the world…is one we can be thankful for, since its terms are exclusively those of love, understanding and patience. It is one of the few spontaneous guarantees of possible unity that mankind can show, and the revival of an appetite for poetry is like a revival of an appetite for all man’s saner possibilities, and a revulsion from the materialist cataclysms of recent years and the worse ones which the difference of nations threatens for the years ahead. The idea of global unity is not new, but the absolute necessity of it has only just arrived, like a sudden radical alteration of the sun, and we shall have to adapt or disappear.